Why Not Epoxy DIY Coatings? We are often asked about the discount epoxy kits at the popular home improvement store. Just about anyone can go to these stores and purchase inexpensive one or two-part epoxy kits from major manufacturers, but the question is: Should you? Generally speaking, these discount kits are of inferior quality, although we do not wish to disparage any particular brand. Many of the epoxies in these kits are water based and, in most cases, are only concrete paints. Discount kits have their places, such as for laundry room floors and light foot traffic areas. But, for the heavy duty use required for automobile parking, discount kits generally will not fit the bill. Unfortunately, some commercial installers are using discount kits in order to keep their costs down. If you have received a low-ball bid on a concrete coating job at your home, you should be quite suspicious. The brand and type of coating they intend to use. Where the installer intends to purchase it. High-grade coatings are purchased from concrete specialty supply houses and directly from manufacturers. What is the installer’s method of preparation of the concrete, if they acid etch for their preparation, run away! Epoxy Coatings Don’t Resist UV Light Very Well. It has been our experience, in reviewing and inspecting concrete surfaces that are coated with such products, that the discount coatings fail prematurely for two reasons. The first problem with such coatings is that they lack sufficient abrasion resistance and proper prep of the concrete substrate. Thus, such coatings are prone to scratching, peeling and ultimately failing and coming up from the concrete. When a concrete coating fails to adhere to the concrete below, the coating chips away, revealing the concrete underneath. Also, most of the epoxies on the market today are not UV tolerant resulting in color fade and clouding of the coating material. This usually happens in a manner of months when only partially exposed to the sunlight. For our polyurea/polyaspartic coatings, we prepare the floor using a diamond grinding technique, instead of acid etching, to ensure the floor will hold onto your new floor coating. this is part of what makes it a superior coating option. 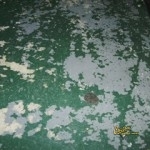 Epoxy Coatings Are Fine For Low Traffic Areas, But Not For Garages! Many contractors today that do concrete coatings still use outdated and failure-prone epoxy coatings when they do a job. The main reason for this is cost: less cost for them means more money in their pocket. A decent contractor is going to be up front and tell you what his material make-up is and how his process and system is put down. Be very wary of low-ball bids; if it sounds too good to be true, it probably is. 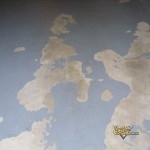 A quality floor coating system will not consist of cheap epoxy or concrete paint, and prep is really the key. If a contractor uses acid to prep the concrete, that is a major red flag and one that should be avoided. Even if you have a coating on the floor now that is peeling up, don’t worry, that can be removed and a quality coating with proper prep can be applied. If you are looking for a high-quality epoxy garage floor coating in Haslet and Fort Worth, TX, give our expert contractors a call at 214-494-9068 or 817-308-1305. We have been providing top quality garage solutions since 2003, and we know garage floors! We offer a variety of garage floor coating services as well as garage storage solutions, and we look forward to serving you soon! Updated on September 19, 2018 at 6:34 pm by Custom Garage Works.